Like many of you, a couple of weeks ago, I watched the most recent Nintendo Direct; and like many I was taken by surprise when Nintendo announced a new Zelda title in development by Tecmo Koei. I was excited for a new Zelda title, but it seemed like a very non-Nintendo move, despite the Zelda series having been leant to Capcom and less successfully to Philips in the past. What makes this different, though—if memory serves—is the fact that this is the first time Nintendo has moved one of their characters into a new genre and let a new developer handle the transition. When I think of this move though, I can't think it's anything but desperate. 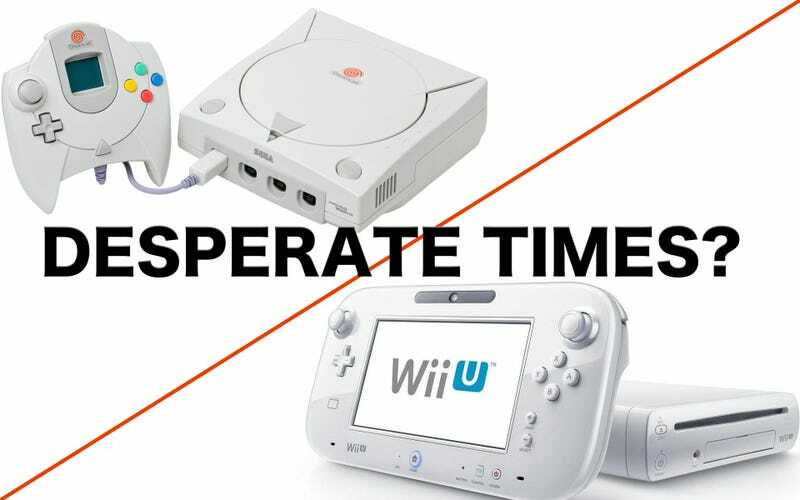 Let's be clear, though, desperation isn't a bad thing in gaming. In fact, it's one of the best things that can happen to a company entrenched in its ways. I really can't help but be reminded of SEGA's Dreamcast era; SEGA was in need of some traction and while we know how it all ended, SEGA ended up producing some of the best, most memorable games in history. Shenmue I and II, Jet Set Radio, Seaman, Crazy Taxi, Samba de Amigo and Phantasy Star Online were incredible games that arguably never would have existed if SEGA's back weren't up against the wall. While Nintendo has enough cash in its coffers to prevent it from going under, the Wii U situation is starting to seem a little dire; especially with PS4 and Xbox One already rapidly closing the sales gap. Zelda Musou seems very non-Nintendo in the best possible way. Hopefully this is just the first move of many from a new, hungry Nintendo the likes of which we haven't seen ever, really. The Wii U may not be successful now, but if Nintendo is willing to take chances similar to what they've demonstrated with Zelda Musou, we might not be be singing the same tune in 2015.